This is a zoom lens manufactured by Canon and the model was launched 2012. This lens is designed and meant for Canon cameras with a smaller sensor (often referred to as 'APS-C') which means that the lens does not fit all camera models. By clicking on the link below you can make sure that the lens works with your camera model and you should do an additional check with your local dealer as well, before you buy the lens just to be sure. The lens has a focal length of 18-135 mm. Since the lens is designed to be used on a camera with smaller sensor ('APS-C') the focal length will be equivalent to 29-216 mm on your Canon camera. One thing to consider is that the lens has a variable brightness, which means that depending on how much you are zooming the lens will have a different maximum aperture value. At 18 mm the lens brightness is f/3,5 and at 135 mm the brightness is f/5,6. Through the link below you can read more about what this could mean for you as a photographer. There is a lens hood that fits the lens (model name "EW-73B") but unfortunately this is something that is not included when purchasing the lens and must be ordered and bought separately, as an accessory. 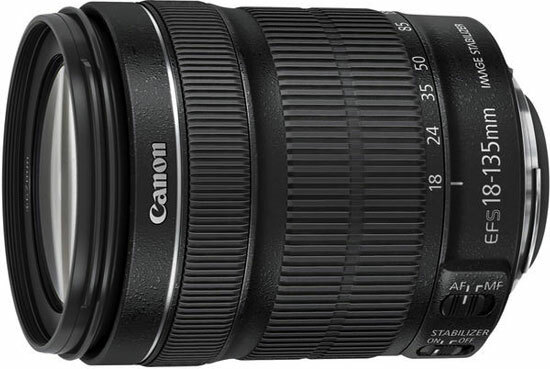 Text from Canon: "Designed to exceed expectations and ideal for video and still images alike, the new EF-S 18-135mm f/3.5-5.6 IS STM marks a new standard for EF-S lenses. It features a refined Image Stabilization system that delivers up to four equivalent stops of shake correction throughout the zoom range; and offers a maximum magnification of 0.28x at the telephoto end, while remaining even more compact in size. This EF-S lens supports the Canon EOS Rebel T4i DSLR´s Movie Servo AF feature for smooth and quiet continuous AF during movie shooting by utilizing a new six-group zoom system and the adoption of a stepping motor and focus mechanism. High-speed autofocus is achieved thanks to an Inner focusing system, high-speed CPU, and optimized AF algorithm. Appearing for the first time in a Canon lens is Dynamic IS (Movie Shooting Mode only) that uses a wide image stabilization correction range to help ensure steady video while shooting when walking. Focus down to 0.39m at any zoom setting for a close-up view of your subject."